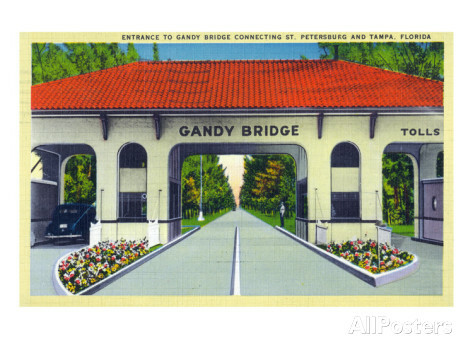 Gandy Bridge is a six-mile bridge connecting Tampa with St Petersburg. James Bond drives across the bridge from St Petersburg to Tampa after his second meeting with The Robber in Live and Let Die. The original bridge was constructed in 1924 and this was the one on which Bond traveled. Three years after the novel takes place, a second span was added to the bridge. At one time it was the longest bridge in the world. 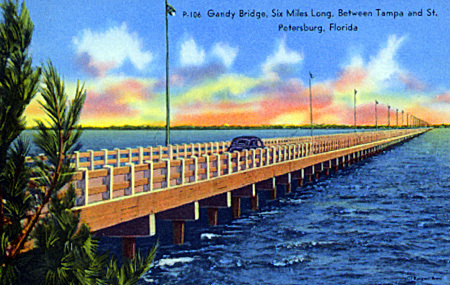 Bond enjoys the cool air of the bay on his face, and at the end of the bridge, he turns left towards the Tampa airport, spending the night at the first motel that looked awake. After awaking at midday, he writes his report to the FBI and heads to the airport. 1952- Bond walked through these doors the following year. In Live and Let Die, James Bond and Felix Leiter make their Florida headquarters on Treasure Island, at a place called The Everglades. Treasure Island is next to St. Petersburg, and has been a popular beach area for many years. they were checked at the intersection of Park Street and Central Avenue, where the Avenue runs on to the long Treasure Island causeway across the shallow waters of Boca Ciega Bay. You can see on the map the intersection of Park and Central which looks like this today. Bond paid off the cab at The Everglades, a group of neat white-and-yellow clapboard cottages set on three sides of a square of Bahama grass which ran fifty yards down to a bone-white beach and then to the sea. 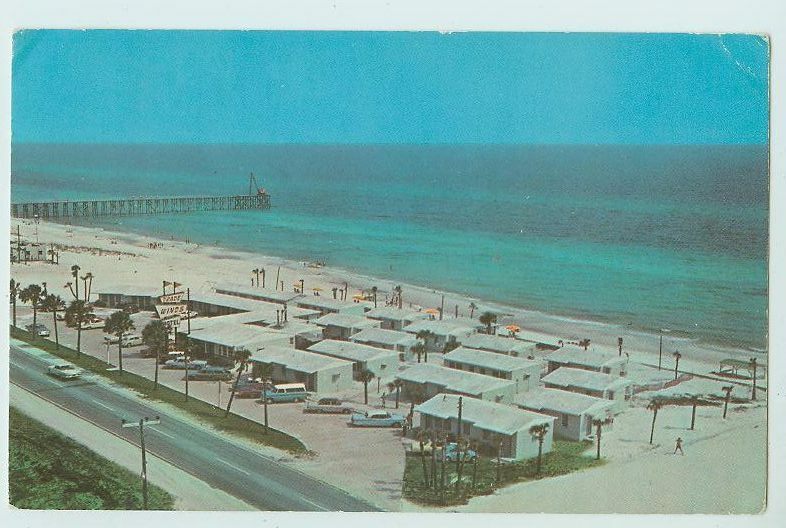 From there, the whole Gulf of Mexico stretched away, as calm as a mirror, until the heat-haze on the horizon married it into the cloudless sky. They’re assigned to cabin number one – right on the beach. While this is not The Everglades, it is another group of cottages on Treasure Island from about the same time period. 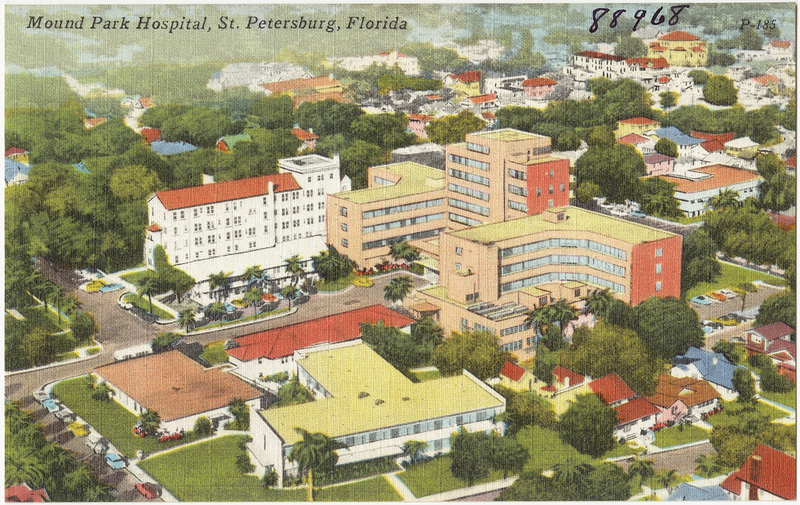 When Felix Leiter goes missing one morning, Bond receives a call at The Everglades from a “Dr Roberts” at Mound Park Hospital, saying his friend is there. Bond hurries over. The call turns out to be a misdirection play to get Bond away from the cottage. Here are a few other views of Treasure Island. From Live and Let Die when James Bond is in Florida. 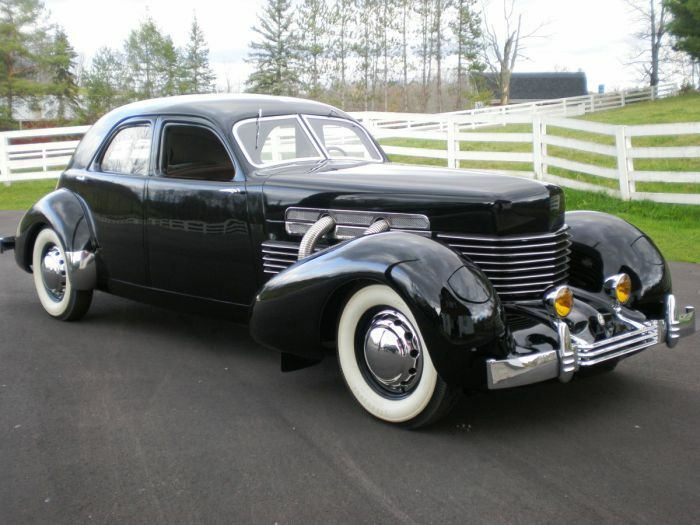 But Leiter had got hold of an old Cord, one of the few American cars with a personality, and it cheered Bond to climb into the low-hung saloon, to hear the solid bite of the gears and the masculine tone of the wide exhaust. 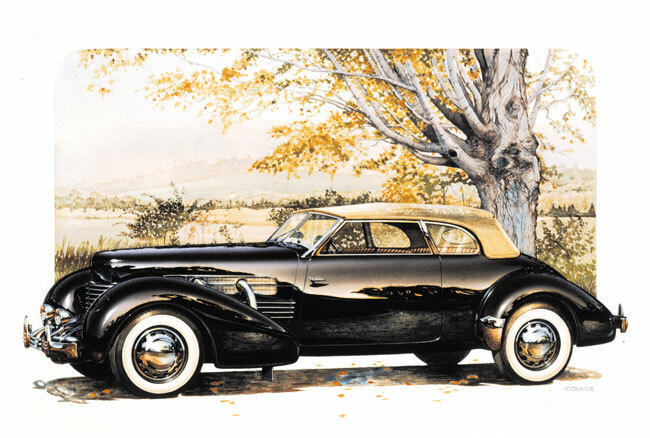 Fifteen years old, he reflected, yet still one of the most modern-looking cars in the world. 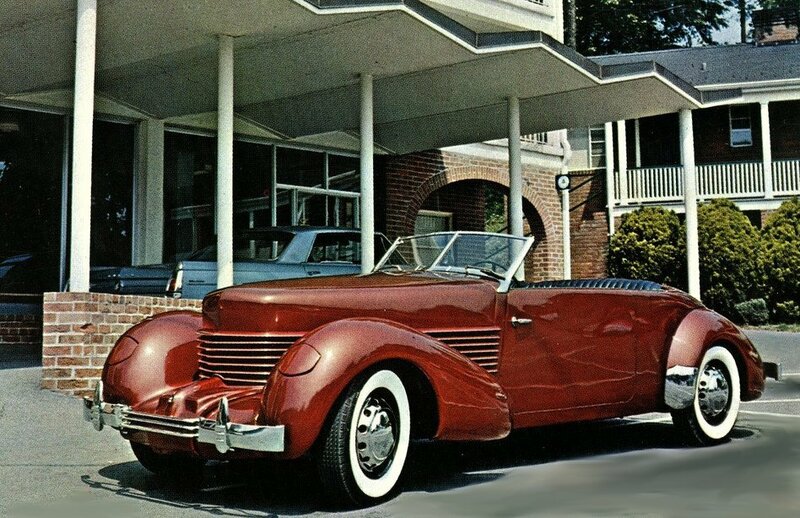 For more information on the Cord, including vintage advertising check this post – Vintage Cord Advertiments Here is another detailed look at a 1937 Cord – 1937 Cord 810 Westchester : Classic Cars For everything you ever wanted to know about Cord, look at this gorgeous book – Cord Complete. James Bond briefly visits the city of Jacksonville in Live and Let Die, when he and Solitaire hop off the Silver Phantom train to avoid Mr Big’s men. The station they would’ve entered at that time would’ve been the Union Terminal, which at one time was the largest railroad station in the south. 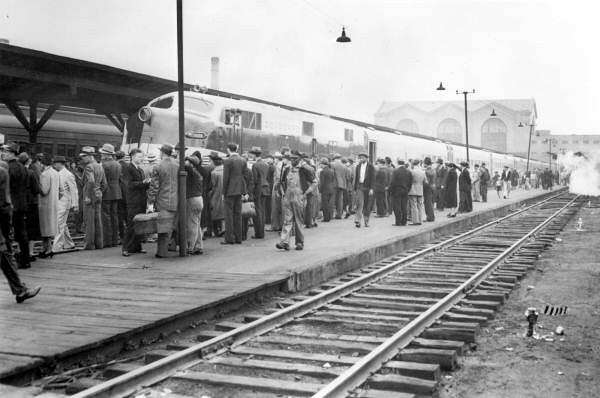 This photo is from the debut of the Silver Meteor in Jacksonville. Bond and Solitaire go for a “bad” breakfast at a nearby diner, and then come back. 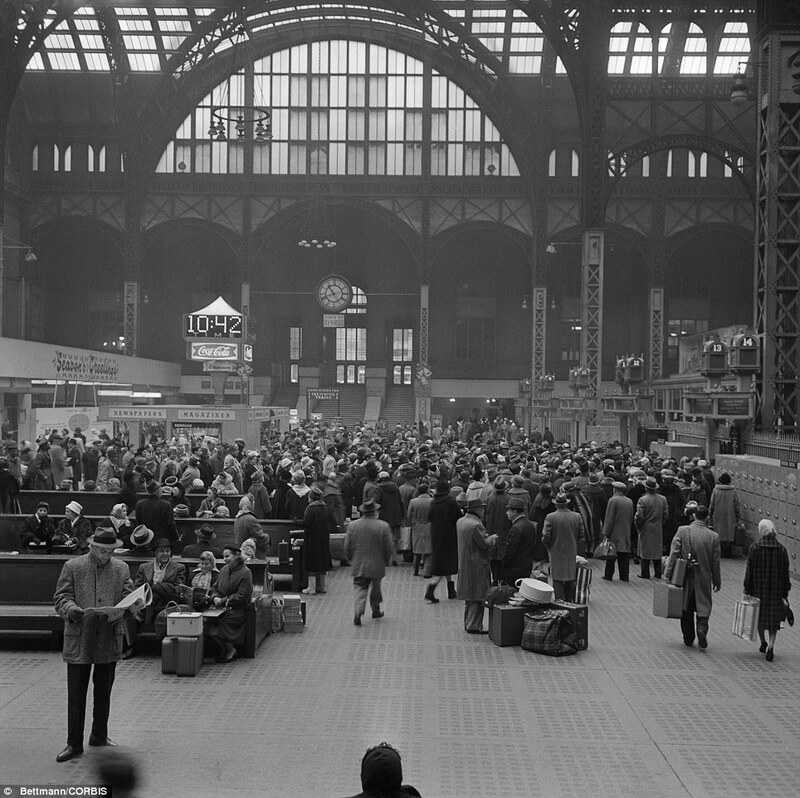 When they had paid they wandered back to the station waiting-room. The sun had risen and the light swarmed in dusty bars into the vaulted, empty hall. They sat together in a corner and until the Silver Meteor came in Bond plied her with questions about The Big Man and she could tell him about his operations. While the building still stands, it is no longer a train station. Here is what the room that Bond and Solitaire likely sat in looks like today. 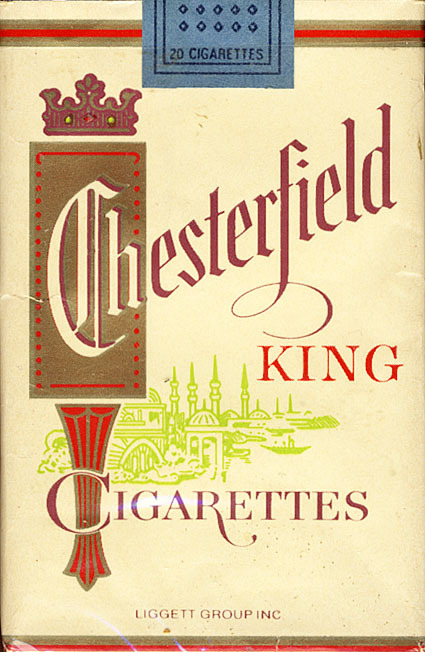 This American brand of cigarette pops up throughout the Bond novels. In Casino Royale, it is the brand that American agent Felix Leiter is smoking. As they get together for their first drink. His grey eyes had a feline slant which was increased by his habit of screwing them up against the smoke of the Chesterfields, which he tapped out of the pack in a chain. In Live and Let Die, Bond twice is cited as smoking Chesterfield Kings, first at the St Regis while contemplating events that brought him to his present assignment, and then while on the Silver Phantom with Solitaire. Bond slit open a fresh pack of King Size Chesterfields with his thumb-nail, as he settled back in his comfortable chair in the warm luxurious room, his mind went back two weeks to the bitter raw day in early January when he had walked out of his Chelsea flat into the dreary half-light of a London fog. He dug in his pocket for his cigarettes and lighter. It was a new pack of Chesterfields and with his right hand he scrabbled at the cellophane wrapper. Solitaire ends up opening the pack, removing a cigarette and lighting it for him. He tells her she’s going to be busy because he smokes three packs a day. Interestingly, in Diamonds Are Forever, which takes place largely in America, we’re not told which brand Bond is smoking. He could’ve brought enough of his Morland Specials to make it through the trip, I suppose. Tiffany Case smokes her Parliaments throughout. In Goldfinger, Bond returns to America, and he is back with his Chesterfields. When he is a guest of Mr Du Pont he starts his day as follows. He went back into the bedroom, picked up the telephone and ordered himself a delicious, wasteful breakfast, a carton of king-sized Chesterfields and the newspapers. He holds out the pack of Chesterfields to Jill Masterton when he meets her and she accepts one. Then, later in the book when Bond is a guest/prisoner of Goldfinger, he enjoys bossing Oddjob around. Oddjob, I want a lot of food, quickly. And a bottle of bourbon, soda and ice. Also a carton of Chesterfields, king-size, and either my own watch or another one as good as mine. Quick march! Chop-chop! Then, as again a prisoner of Goldfinger, he refuses to talk until his demands are met. We will have a talk, Goldfinger. And I will tell you certain things. But not until you have taken off these straps and brought me a bottle of bourbon, ice, soda water and a packet of Chesterfields. Then, when you have told me what I wish to know, I will decide what to tell you. But Bond had already paid for the carton and for a packet of Chesterfields for himself. When Bond returns to America in The Spy Who Loved Me, he offers Viv a cigarette after she offers to make him some scrambled eggs. ‘Have one? Senior Service. I suppose it’ll have to be Chesterfields from now on.’ His mouth turned slightly down as he smiled. In 007 in New York, Bond again has his Chesterfields. James Bond sat back and lit one of his last Morland Specials. By lunchtime it would be king-size Chesterfields. 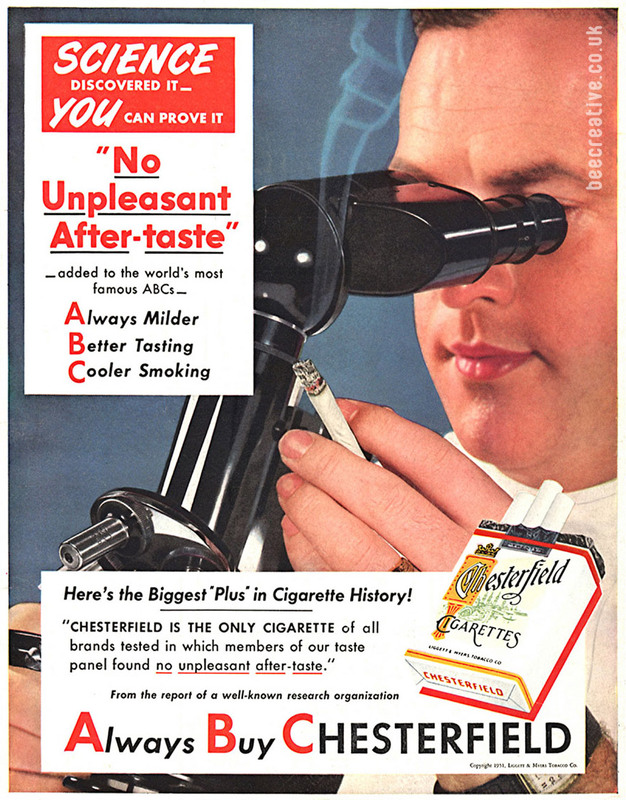 Originally produced by the Liggett & Myers Tobacco Company, the brand was sold in 1999 to Philip Morris, and while still being produced, is more popular in Europe these days. 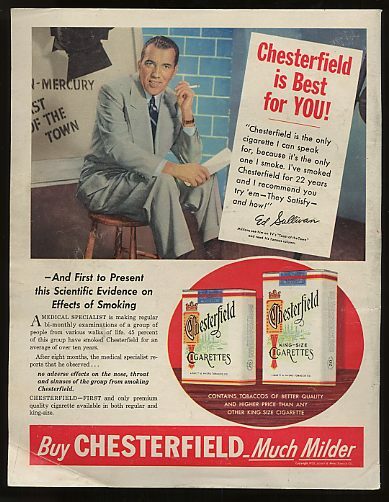 During the 1940’s and 50’s Chesterfield was a major sponsor of television programs, and their advertisements were plentiful, many featuring major movie stars and athletes of the day. This was the train taken by James Bond and Solitaire on their trip from New York City to Florida in Live and Let Die. 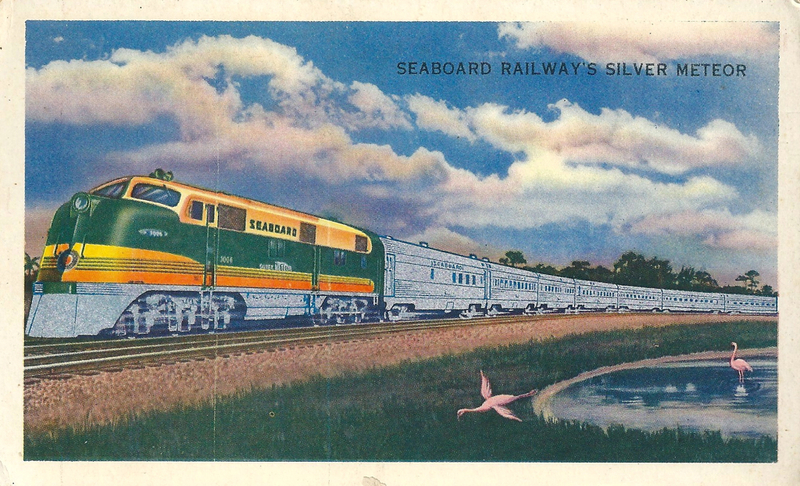 Seaboard Air Line Railroad introduced the train and route in 1939, and now under Amtrak, continues to run to this very day. 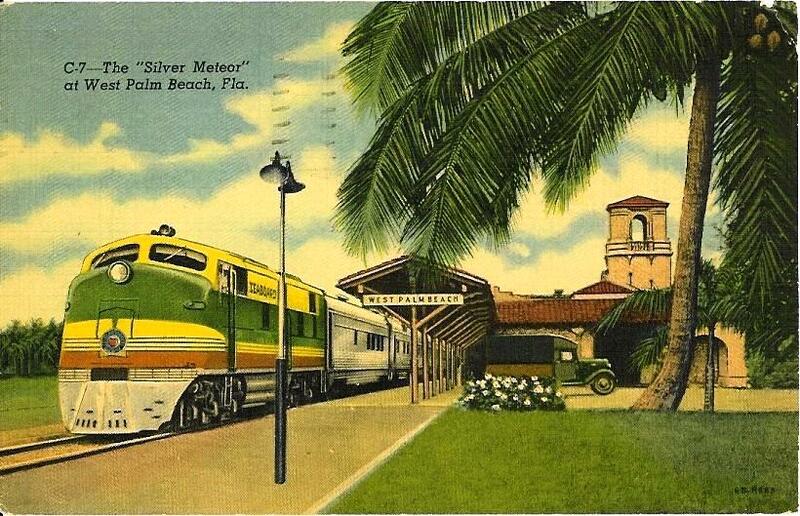 Fleming refers to it as the Silver Phantom, which he also makes reference to as a “sister train” to the Silver Meteor train. In real life, the sister train to the Meteor was the Silver Star. The train leaves from Pennsylvania Station, where Bond and Solitaire arrive separately. It lay, a quarter of a mile of silver carriages, quietly in the dusk of the underground station. Up front, the auxiliary generators of the 4000 horsepower twin Diesel electric units ticked busily. Under the bare electric bulbs the horizontal purple and gold bands, the colours of the Seaboard Railroad, glowed regally on the streamlined locomotives. The engineman and fireman who would take the great train on the first two hundred mile lap into the south lolled in the spotless aluminium cabin, twelve feet above the track, watching the ammeter and the air-pressure dial, ready to go. Their sleeping room is compartment H in car 245, toward the rear of the train. They meet and their Pullman Attendant Baldwin takes care of them, even giving Bond a warning that they have an enemy on the train. Bond and Solitaire have chicken sandwiches for lunch, (with Old Fashioneds) and scrambled eggs (with “bottled” martinis) for dinner. After a note is slipped under their door, Bond decides to leave the train early, with the assistance of Baldwin, he and Solitaire exit the train in Jacksonville. “Right. Now jot this down on the back of your cheque book and see you get it right. Book me a compartment on the Silver Meteor to New York tonight. Have a bottle of vintage champagne on ice and plenty of caviar sandwiches. The best caviar. It’s a luxurious trip from another era, similar to the experience of the Stratocruiser, where there is fine dining, service, and other comforts that you just don’t find in today’s travel experience. 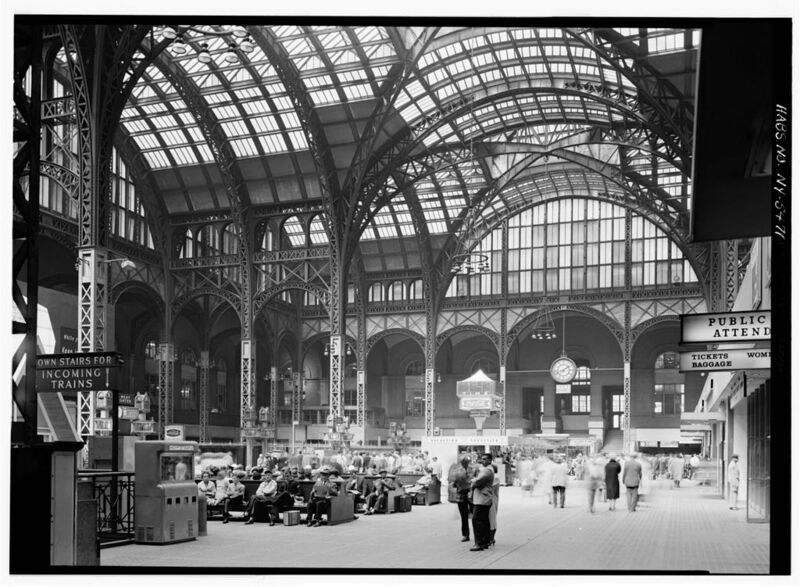 The original Penn Station was built in 1910 and was destroyed in 1963 to make room for the new Madison Square Garden. In Live and Let Die, it is the setting for Bond and Solitaire’s exit from New York via The Silver Phantom. 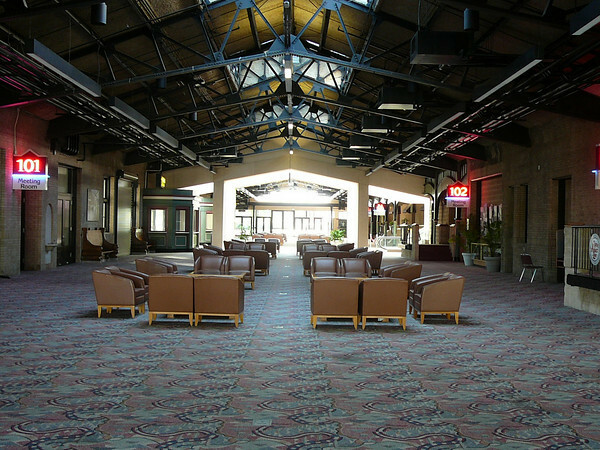 After Bond is dropped off at the drive-in by his cab, Bond walked quickly through the glass-covered concourse and through gate 14 down to his train. and finds his gate. Is that the correct 14 there on the right? Down to the track level. 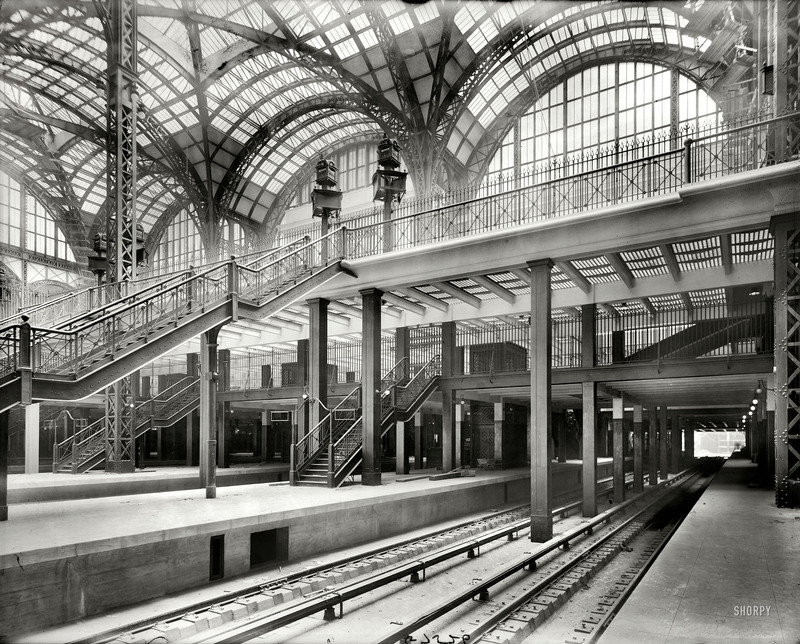 You can get some good footage of this location in Alfred Hitchcock’s classic Strangers on a Train. 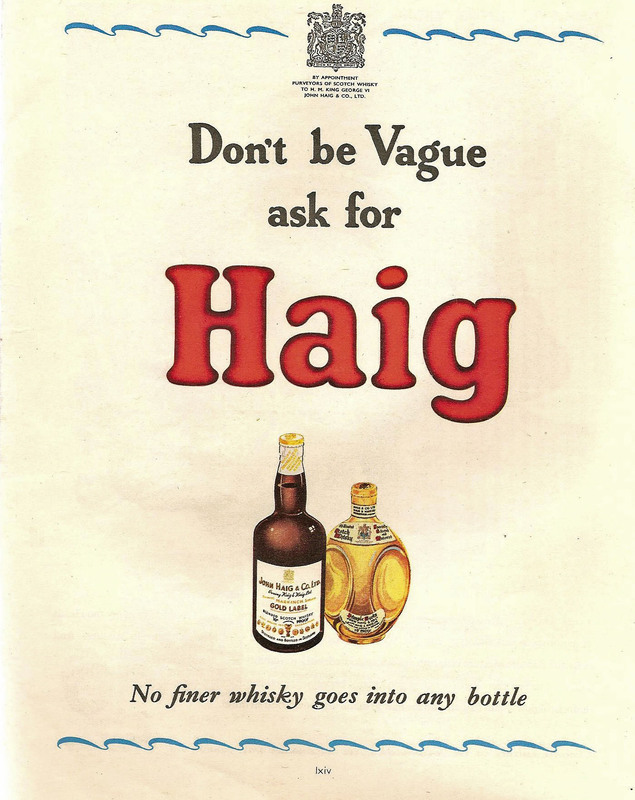 Haig and Haig Pinchbottle is a blended scotch whisky in a unique three-sided bottle. The bottle was actually trademarked in the United States in 1958. In Live and Let Die at Sugar Ray’s, Bond and Leiter have scotch-and-soda with Haig and Haig Pinchbottle. When Bond shows up at The Everglades, Leiter grabs a bottle of Haig and Haig and some soda water and they both have a long drink. 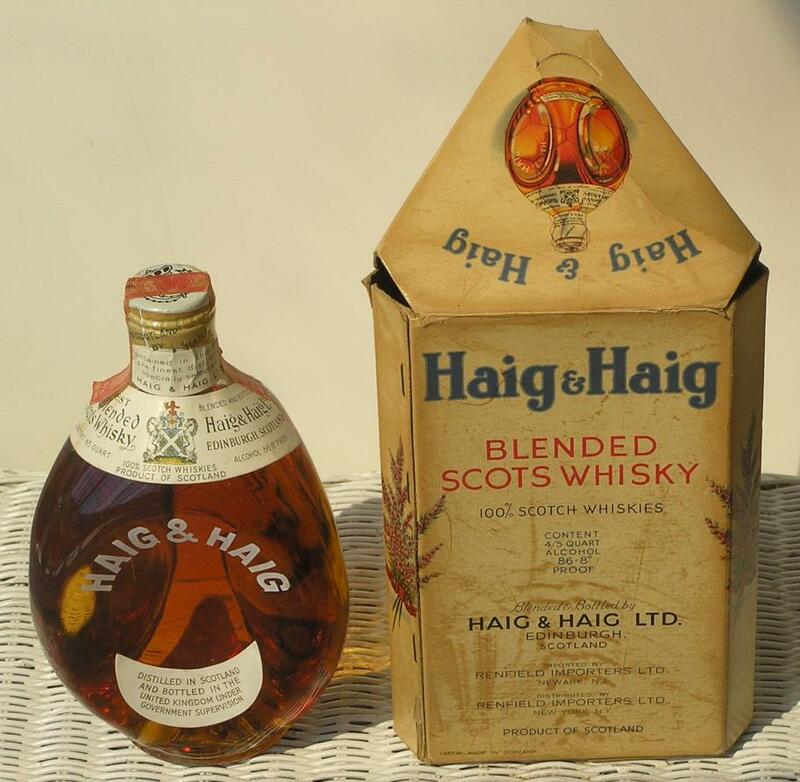 In On Her Majesty’s Secret Service, during Bond’s initial encounter with Marc-Ange Draco, the head of the Union Corse produces bourbon for Bond, and a bottle of Pinchbottle Haig for himself. In Live and Let Die, James Bond spends an evening in Harlem, accompanied by Felix Leiter. Harlem is a large neighborhood on the northern section of Manhattan. 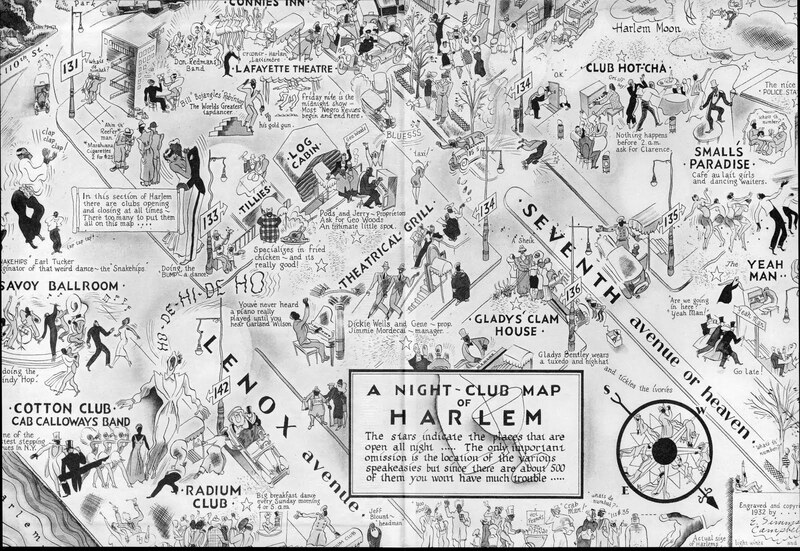 After Martinis at the St Regis, they take a bus to Harlem. First stop is Sugar Ray’s which is on Seventh Avenue at 123 Street. This was a real spot, owned by the boxer Sugar Ray Robinson. Bond and Leiter “walked under the canopy” and slip into a booth. This photo is from 1950. 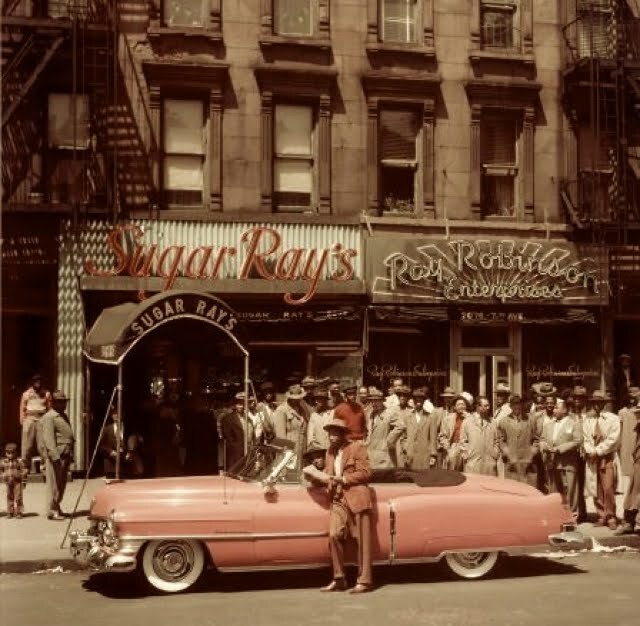 For more on Sugar Ray’s check this post from Harlem Bespoke and this article in the New York Times. Bond and Leiter have Scotch-and-soda – with Haig and Haig Pinchbottle scotch. They listen in on a conversation at a neighboring table – one that is cringe-inducing to read 60 years later. Next to Seventh Avenue, you’ll notice Gladys’ Clam House, and then up a block to the left, you’ll see Tillies, which specialized in fried chicken. I wonder if Fleming based Ma Frazier’s on a couple of places. There could’ve actually been a Ma Frazier’s, but I haven’t found any reference to it. You can see above that they would’ve passed Tillies on their way to the Savoy. 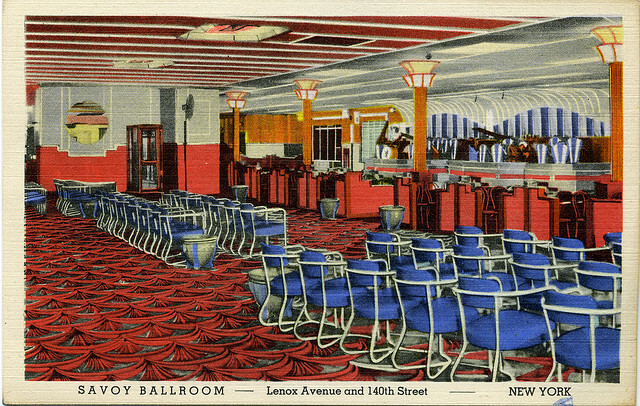 On their third stop of the evening, they hit the Savoy Ballroom. By the time they left the restaurant it was ten-thirty and the Avenue was almost deserted. 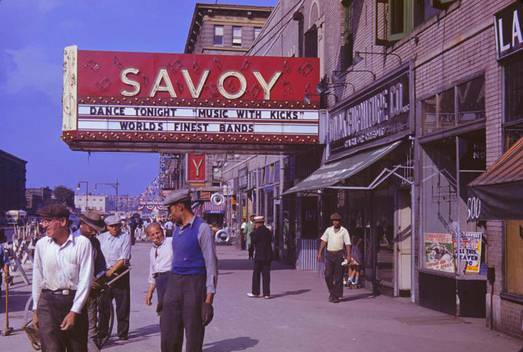 They took a cab to the Savoy Ballroom, had a Scotch-and-soda, and watched the dancers. They had a table near the rail round the huge floor. Bond was spellbound. He found many of the girls very beautiful. The music hammered its way into his pulse until he almost forgot what he was there for. 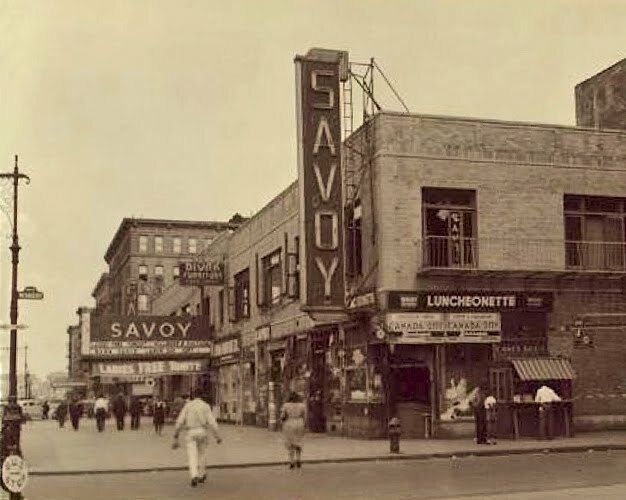 The Savoy closed in 1958, and was torn down. There is a plaque that marks the location. Finally, they end up at The Boneyard, a “small place on Lenox Avenue”, and unfortunately we’re not given more details on the location. 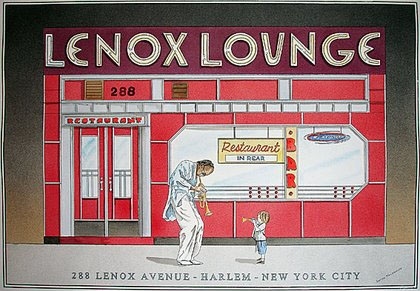 Part of me wonders if Fleming based The Boneyard on the Lenox Lounge, a Lenox Avenue landmark that was in its prime during that time. It’s a complete guess on my part, but it fits the type of place Fleming was describing. 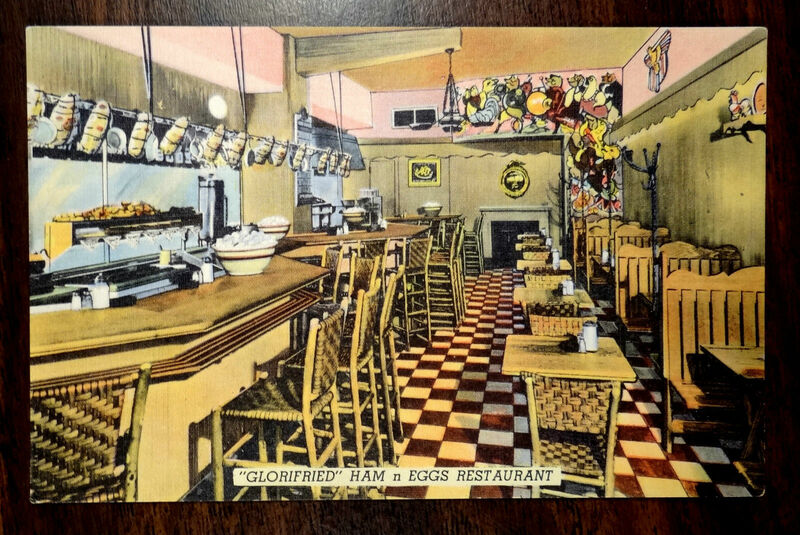 In the American version the clever marketing ploy of combining ‘glorified’ with ‘fried’ to make ‘gloryfried’ is changed to ‘glorifried,’ it is described as a ‘restaurant’ and not an ‘eating house’ and the eggs are now advertised as being ‘on the Farm Today’ instead of still being in the hens. The time that Bond was due to meet Felix Leiter and Captain Dexter is also changed from figures in the British edition to words in the American edition. These cultural changes in the American edition were made because clearly the American editors were not nearly as amazed as Fleming – ‘the Englishman abroad’ – was by the different nature of American cuisine and culture. Perhaps they thought such references would be patronising for the American readership, as it would be instantly more familiar to them. It is perhaps ironic that the change was made to the slogan of the American ‘eating house,’ as Fleming, being the brilliant journalistic observer of other countries and cultures that he was, would surely have copied it verbatim from just such a place into his notebook for later use.